This article is an attempt at setting something straight that has been bugging me for a while now. And apparently it’s not just me – I got the inspiration to write from numerous discussion threads at The Gear Page and other forums, where the topic keeps popping up. In fact, many articles on this website can trace their origins to discussions on various guitar/gear forums. Most proper analog delays use bucket brigade chips (abbreviated ”BBD” for ”Bucket Brigade Device”), which actually operate just like a bucket brigade – they have a number of ”bucket” stages (sometimes as many as 4096), where the signal is passed from stage to stage. Each stage takes a certain amount of time to charge and discharge (pass it along to the next stage), which delays the signal coming out at the end. This type of circuit is quite crude, and has to be quite severely filtered to avoid it sounding bad. Incidentally, that filtering is a very large part of what makes a BBD-based delay sound the way it does. Another drawback of the BBD technology is the quite short delay times they can produce. Most analog delays can’t be tweaked past 300ms or so, before the repeats start so sound distorted. Again, the sound a BBD chain makes when pushed to the limit is part of the allure of analog delays. But in order to get longer delay times, some manufacturers started chaining several BBD chips together, leading to quite complex circuits. When digital delay chips started appearing on the market in the early ’80s, manufacturers used them instead of the BBD’s, partly because they offered longer delay times with simpler support circuitry (timing chips etc) and partly because they needed less filtering, offering a more clear sound. Still, the thinking was often rooted in the BBD realm, so the first digital delays used more or less the same circuits as before, but with the digital delay chip stuffed in there. Simple digital delays where everything else is analog circuitry (Boss DD-2/3, Ibanez DE7, all delays using the PT2399 circuit). Some of these are voiced to sound like analog delays, but they’re obviously still digital. Digital delays where the feedback path is kept ”inside” the digital realm (Boss DD-5 etc). Modelling digital delays – some of which can sound like tape, analog etc (Boss DD-7, DD-20, Line 6 DL-4 and Echo Park, TC electronic Flashback, Strymon Brigadier and El Capistan etc). Some of these process the entire signal, while others work more like the simper units (keeping the dry signal analog at all times). Some companies like to market their digital delays as analog/digital hybrids, but in reality they are almost always simple digital delays (the analog parts they refer to is the ”everything else” bit). I’ve seen very few true hybrids, and the Seymour Duncan Deja Vu is one. In that unit, the initial delay is generated by an old-fashioned bucked brigade chip and filtering etc. In order to get longer delay times, they have then added a crystal clear digital delay circuit which can further delay the analog delay to delay times that would be impossible with BBD chips. Furthermore, you can dial it in so you’re hearing only the BBD or digital side, or anything in between. Analog voiced digital delay – analog dry and feedback path, with filtering to make it sound like a BBD circuit. 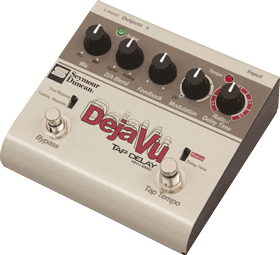 Digital delay – any normal delay that isn’t specifically aimed at emulating anything else. The feedback path can be analog or digital, as well as the dry path. Hybrid delay – units that use both BBD and digital circuits. Modelling delay – anything that uses digital technology to make the delay sound like the ones above. These can have full analog -> digital conversion (including the dry signal), or analog dry path (where only the delay bit is digital). Some delays include modulation, which is either a feature that can modulate (alter slightly up/down in an undulating fashion) the delay time, or a separate pitch vibrato feature that the delay signal is fed through. The former allows you to turn the delay into a chorus effect, by setting a really short delay time and using the modulation to alter that delay time. The latter – which is how the Deluxe Memory Man seems to work – already have a separate chorus/vibrato circuit. Either way, it has no bearing on whether the pedal is digital or analog – modulation delay can be found using either technology. Some of the best analog modulation delays are the Malekko 616 and MXR Carbon Copy, and of course the Electro-Harmonix Deluxe Memory Man. But one of my favourites is the Ibanez DML series, which is a digital delay with modulation. And a few of the analog-voiced digital delays out there feature modulation too, such as the Disaster Transport from Earthquaker Devices. And some of the modelling type delays, such as the TC electronic Flashback and Strymon Brigadier, can produce quite stunning modulated delay sounds. Do I need a buffer?